(NC) – You may not be a natural wheeler and dealer, but that doesn’t mean you can’t come prepared to negotiate the purchase of your next set of wheels. 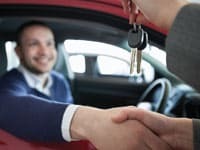 Once you’ve located a car that’s of interest, asking as many questions as you can think of about it will signal to the seller that you’re a serious buyer, making them more willing to negotiate. Its history, its condition, all its relevant details—and the way the seller answers can give you insight into how well they’ve treated the vehicle. Information is what’s most valuable. Use the autoTRADER.ca Value Finder tool to research pricing for similar cars. If a car is priced way over or under, compared to similar models, consider it a red flag and make that your first question should you decide to contact the seller. Once you’ve had the chance to test drive the car with your mechanic, take time to review the CarProof report. Check for liens, previous accidents and confirm the VIN, province of registration and other salient details. Make sure that the report matches what you’ve been told by the seller. Like the CarProof Report, take a good look at all the details and ensure that they’re accurate and as advertised. Any discrepancies should give you leverage when it comes to landing a final price in your favour.